Captions. Credits. Geo. Metadata. There is a lot more to understanding a picture than the picture itself. In storytelling, visuals are the nervous system. From illustrations to photographic representation, the visual components of a narrative tell the story, command attention, reinforce hierarchy and important story elements, and enhance understanding. When strategically displayed, they have the power to entrance a viewer, drawing them into a narrative that might otherwise be dismissed. If visuals are the nervous system of a story, the picture’s caption, credit-line, tags and other associated metadata could be thought of as the peripheral nerves. They are the layers of communication that strengthen the message. In order to properly produce, store, gather and execute visuals, storytellers must properly utilize the information that describes the visual. 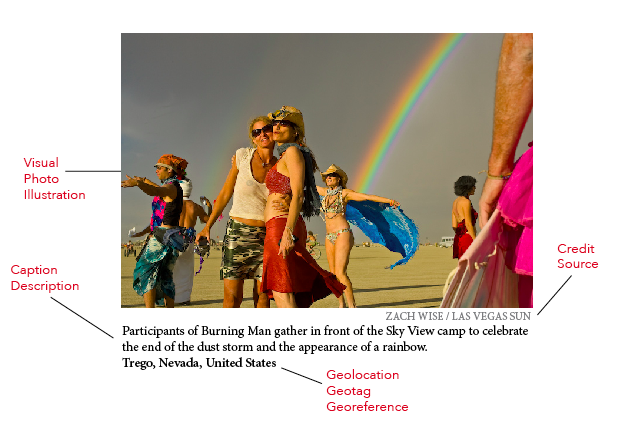 This layer of information above the visual story supplements the visual and includes caption, credit, geo-tagging and metadata (data that describes other data). Krogh is the recipient of the Individual Innovation Award from the U.S. Library of Congress’s National Digital Information Infrastructure and Preservation Program and was named by Microsoft to be part of its Icons of Imaging Program designed to showcase professional photographers recognized around the world as leaders in digital imaging. One easy way to understand this use class is that photographs are really helpful for personal memories. The most prominent piece of supplementary information for a visual is its caption. The caption should verify what the photograph is showing. It’s another layer of verification for the reader. The caption can be a part of the story, according to Charles “Stretch” Ledford, a visual journalist who has filmed and photographed in 50 countries on five continents. Captions also have an under-the-hood aspect in their supportive role beyond what viewers and readers see. Captions become metadata when search engines pick them up. Storytellers can use keywords in their caption to increase the likelihood that their pictures will show up in a Google search, for example. Like captions, credits are a multifaceted tool. There’s also a marketing value in credits. “The more times you see the name Stretch Ledford or the name David Alan Harvey or whoever, it’s like you’re building a brand. You’re associating your name with your visual ability,” Ledford said. One of the modern forms of metadata is found in geolocation, more commonly reffered to as “geo-tagging.” The default setting on many web-enabled devices, including cameras and smartphones, comes with what is known as Exif header data, which is basically a geo-location tag. Unless you turn it off, your camera is a personal GPS tracker of where you’ve been. While geo-tagging can be useful for storytellers to creatively arrange their photographs and get exposure, one expert advises exercising caution when utilizing this tool. Rosenzweig also cautions photographers about where they store their digital photos. “If they store the photos in the Cloud, which most of us do, they are as secure as Jennifer Lawrence’s,” he said. His solution: encrypt before you upload. Encryption is the application of an algorithm, a mathematical technique, to scramble your data such that only a person with the pass phrase can unscramble it. “It’s a way of essentially creating a cyber safe that only you have the key to,” Rosenzweig said. With all of the options available to enhance the visual through data, it can be intimidating to adopt these techniques. Krogh suggests keeping it simple. “Photographers and people who have picture libraries should be attaching information that’s useful to them according to how they understand pictures. “We are entering a world of gigantic opportunity, as photographs become physical daily communication between people. These essays are part of Fall 2014 Interactive Innovation capstone course in Medill School’s MSJ program. This class was taught by Zach Wise in collaboration with Knight Lab. StoryMapJS and SnapMap, as well as SoundCiteJS and TimelineJS. Thoughts on the intersection of journalism and technology, written by Knight Lab fellows, staff and occasional contributors.